LLumar's residential window tinting dealers install superior home tint in Wylie. Help reduce your home energy expenses, live comfortably, and give your home an added layer of security with home window tinting. For more than 60 years, LLumar's home window tints have provided homeowners with protection from the sun’s heat and harmful rays. Today, we continue to help people live comfortably in their homes, whether in an apartment, condo, or house! 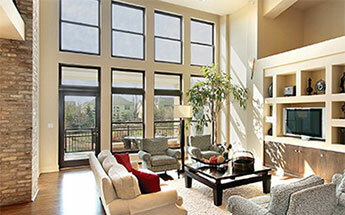 Your residential window tinting company has been handpicked to provide you, and your family, with a great experience. Get a fast and free tinting estimate from your Wylie residential tint location! After our certified technicians in Wylie install your home window tint, you can better enjoy your space knowing that you're helping to protect your family from the sun's harsh rays, while also adding an extra layer of security. Tint the windows in your home to help prevent the fading of treasured artwork, family furnishings, wallpaper, paint, and more by the sun's destructive rays. And did you know? It helps block up to 99% of the ultraviolet rays that cause discoloration and fading. When the weather turns warmer, it helps keep your house cool and comfortable. And guess what? Many customers have reported seeing a decrease in their home energy expenses by up to 15% after their home’s window tint was installed! Given that LLumar is a LEED-certified business, you could save an additional amount of money through tax credits and incentives in your area.